Pour stock into a large pot, add in 1 tablespoon of minced garlic, 1 1/2 teaspoon of minced ginger and 1 tablespoon toasted sesame oil to stock, stir to mix and bring tto a boil. While the stock is coming to a boil, sprailize or jullien the carrot and parsnip, set aside. When the water come to a boil add soba noodles to stock pot, stir and prepare according to package directions. My noodles only took 4 minutes to cook. During the last minute of cooking time for the noodles stir in the carrots and parnips. After final minute of cooking, cover and remove from burner. In a small bowl mix together tamari, agave, tomato paste, 1/2 teaspoon minced ginger, garlic and hot chili oil. Fill half of a small condiment dish with sriracha hot chili sauce fill the other half with the tamari sauce mixture. Spoon soba noodles into serving bowls and garnish with scallions, sprouts, chopped cilantro, mint and parsley and sliced jalapeno. Serve with the tamari and hot sauce. 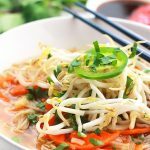 Garnish your noodles with scallions,cilantro, parsley, mint, sprouts and jalapeno.